HOW TO CUSTOMIZE ?? - Customization process is very simple and easy, Please choose your size first, then click " Customize Now " button, fill out the customization from and place your order, Than send us a message with the photo that you would like to engraved on the stone! or send an email to support@sugaryeti.com with your order id number. We will make your memorial stone ready with in one business day and delivery takes 3 days for continental United States. VERY HAPPY ?? - If you are happy with your purchase, please leave us a positive feedback and a good review if you can do it with photos, that will help us to keep up the good work also It will help others to give their decision. Customers would love to read honest reviews and check product photos shared by other buyers, they feel more comfortable when read comments from other buyers. STONE SIZE (!) - Most of our models comes with different size options, Our main stone size is 6 inches by 6 inches however if you would like to go for bigger stone we do have a 12 inches by 12 inches option ONLY for Aged Granite we do have Two extra size such as 12 inches Round and 8-1/2 inches by 11 inches. Please pick your size carefully. NOT HAPPY?? 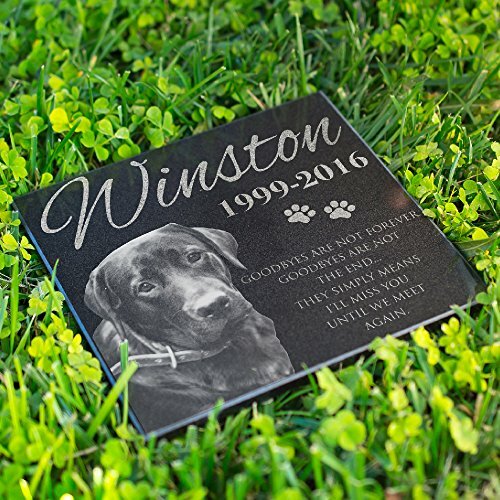 - We do our best to prepare, pack and ship your package, We know memorial stones are very important therefore we double check everything to make it sure there is no misspelling in customization, no cracks or scratches on the stone. Even if we do our best mistakes happen, if you received a broken, scratched, or wrong memorial stone please contact us right away, we will send you a replacement without any question. We only want you to double check the customization details you provided.